Irving House welcomes long-time guests and first-time visitors. 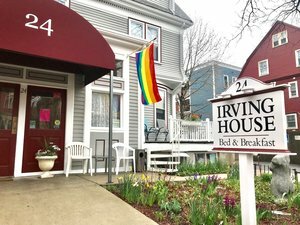 Located near the historic Harvard University, Irving House is a unique bed and breakfast that offers guests comfortable lodging with amenities including breakfast and Wi-Fi. Our staff are always ready to offer recommendations for vibrant Cambridge and nearby Boston. Submit a reservation inquiry today! Irving House has served travelers coming to Cambridge since 1945. In its early years, our house was the annex of The Kirkland Inn and the home of the Misho family who operated the inn until 1990. When we purchased the house at 24 Irving Street that July, it was clear from the guests staying there that the Mishos’ warm hospitality was well known and kindly remembered. Building on their strong foundation, we have been making improvements to the house and our operations in response to the helpful comments of our guests ever since. We're continually involved with the care and renovations of the house, updating the rooms, improving technologies, and expanding amenities for our guests.